For the first time, the voice of Tucson will be heard on a national stage at the Brave New Voices International Youth Poetry Slam Festival. Held in a different city every year, this July six poets from the Tucson Youth Poetry Slam will be traveling to San Francisco to compete in the judged poetry competition––this year the TYPS is the only team from Arizona that has been accepted to compete. Coached by Director Logan Phillips and Community Coordinator Sarah Gonzales, these poets were selected for the honor based off of their placement in the Tucson Youth Poetry Slam Championship, held at the University of Arizona Poetry Center in April, as well as their evident dedication to community and leadership. 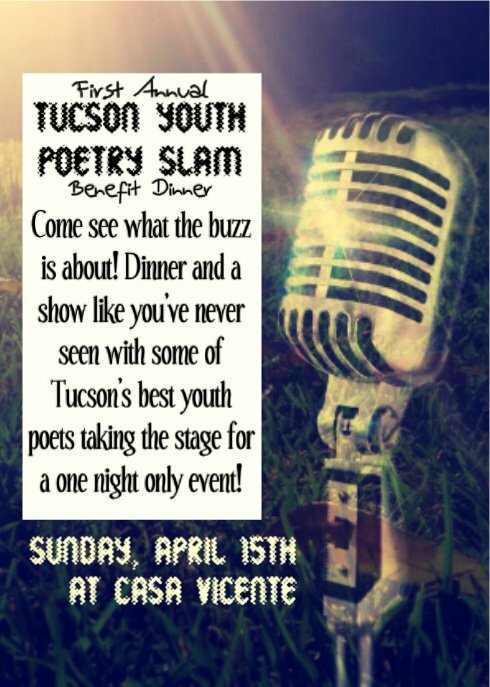 The Tucson Youth Poetry Slam advocates literacy, critical thinking and youth voice through poetry competitions, workshops and community showcases. The program recently celebrated the end of its second season and regularly collaborates with diverse organizations across Tucson. 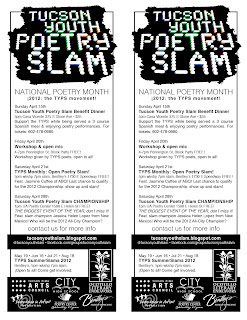 The monthly poetry slam competition is open to all youth 19 & under and is held every 3rd Saturday at Bentley’s House of Coffee & Tea, 1730 E Speedway. Crowds at the TYPS regularly top 100 people. with big events every weekend! You’re going to be hearing from us a lot this month! The TYPS is celebrating NaPoMo in style with a big event every weekend of April! 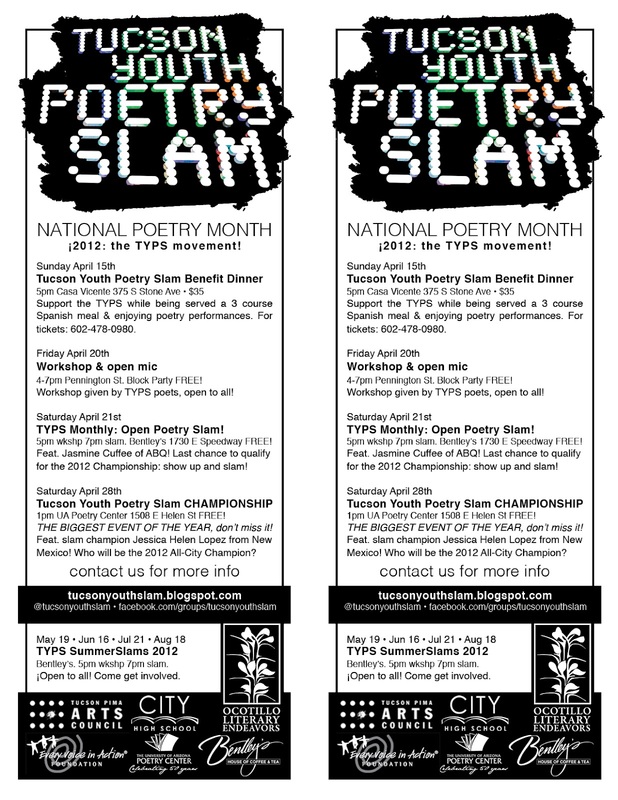 The Ocotillo Poetry Slam Championship is Friday night at 9pm at Main Gate Square. TYPS poets are also specially invited to a workshop given by slam legent PATRICIA SMITH at noon on Saturday at the UA Poetry Center. Check the full schedule here. Our first-ever fundraising event! A formal three-course dinner served by Casa Restaurante Casa Español with poems from TYPS poets. Organized from the youth-led TYPS Fundraiser Committee and students from the UA Blue Chip leadership program. 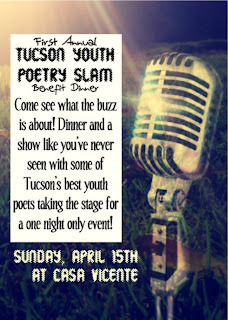 Recommend the event to those interested in supporting youth voice in Tucson, and buy your tickets today! Want to help TYPS grow? Click here! 4-7pm at the Pennington Street Block Party, downtown. Workshop given by TYPS poets, plus an open mic for the masses! The last open slam of the regular season! 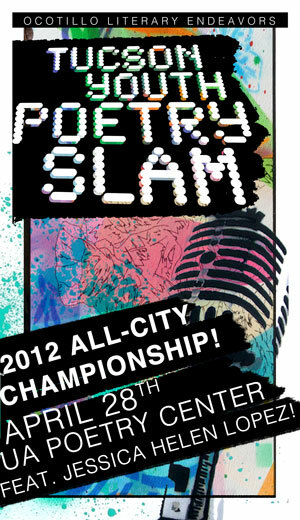 AKA the last chance anyone to participate & thus qualify for the 2012 Championship. Featuring Jasmine Cuffee of Albuquerque! The info will be posted here. This is it! The biggest slam of the entire year! Hosted again by the UA Poetry Center and featuring Jessica Helen Lopez of Albuquerque, New Mexico! To qualify to compete, poets must have participated in at least one regular slam during the 2011-2012 season. Watch the TYPS Group on Facebook and the TYPS Blog for info on how to register! 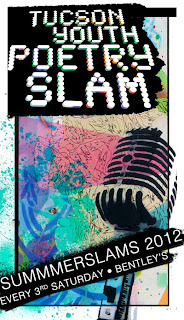 SATURDAY APRIL 21st 2012 The last open slam of regular 2011-2012 Season! Last chance to participate and qualify for the 2012 Championship! Featuring Jasmine Cuffee all the way from Albuquerque! A native of Albuquerque’s South Valley, Jasmine Sena Cuffee has been active in the Metro arts community for nearly 10 yrs. She was a member of the 2004 Poetry Slam team, 2005 Youth Poetry Champion, 2007 City Slam Champion, and player coach for the 2008 UNM Collegiate Slam team. As a performance poet and slam poetry champion, Jasmine has led numerous writing workshops and performances throughout New Mexico and the Western U.S. She has appeared in the Bigger Boat Anthology, Earthships: A New Mecca Poetry Anthology, and ¿De Veras?. She is currently working on her first manuscript Where the Arroyos and Train Tracks Meet which will be the follow up to her first and only chapbook Sunshine and Rapture released in 2007. When she is not poeting, she manages Public Allies New Mexico, an AmeriCorps program that promotes social justice by developing the next generation of community leaders to strengthening non-profits communities and civic engagement. 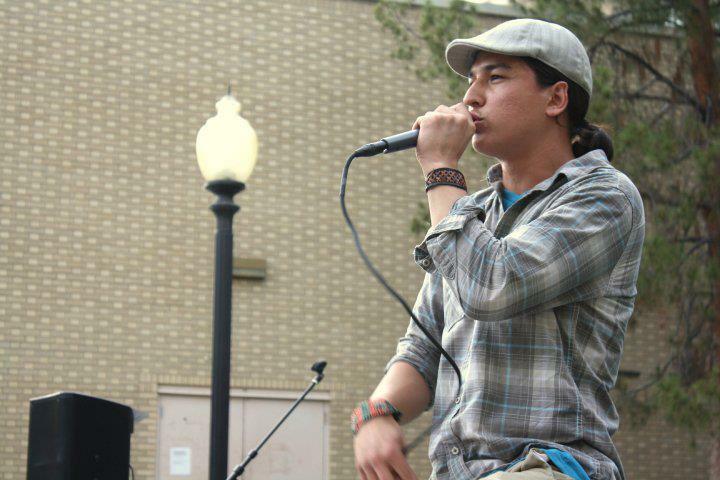 Featured poet: Jazz Cuffee of Albuquerque! 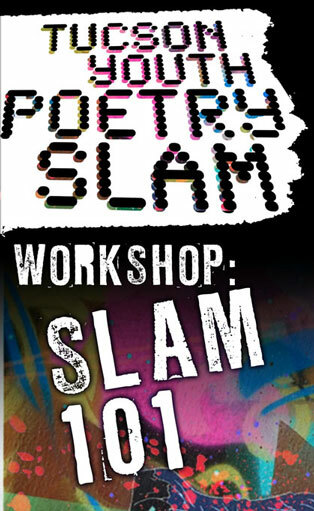 Experienced poets from the Tucson Youth Poetry Slam lead an exciting writing and performance workshop for any interested middle and high school students! Free! All are welcome. 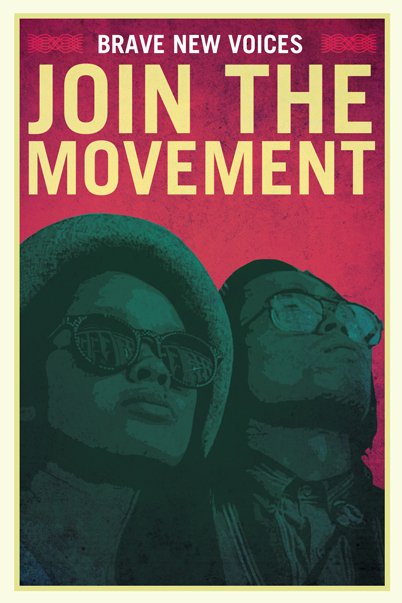 This is a unique opportunity for YOU to explore slam poetry in a youth-centered environment and become part of the TYPS community! A part of UA Poetry Center’s Family Days in collaboration with Voices, Inc. and made possible in part by a grant from the Every Voice in Action Foundation.